The Interview has had the craziest release story of any film in recent memory. But a crippling hacking attack, terrorist threats, and state-sponsored "cybervandalism" aside, the movie is now (finally) available to watch—and you don't even have to leave your couch. If you have other things to do on Christmas Eve and Christmas than watching Kim Jong-Un's head explode, you also might be able to catch it on Netflix a few days later, according to Variety. 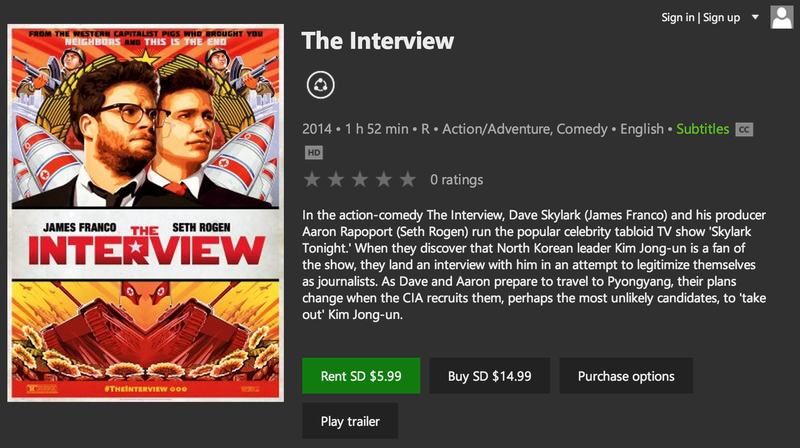 It was only a week ago that Sony had absolutely no plans to release The Interview in any way. After announcing that the movie would be making it to select theaters in time for its originally planned Christmas release, rumors also suggested that Sony was considering video-on-demand avenues, possibly its own Crackle service was reported as a possibility. With The New York Times reporting that Apple backed away from the opportunity, Sony officially announced its partners only an hour before the film's release. So there you have it. The forbidden fruit that is The Interview is now available for munching. Can we stop talking about it now?